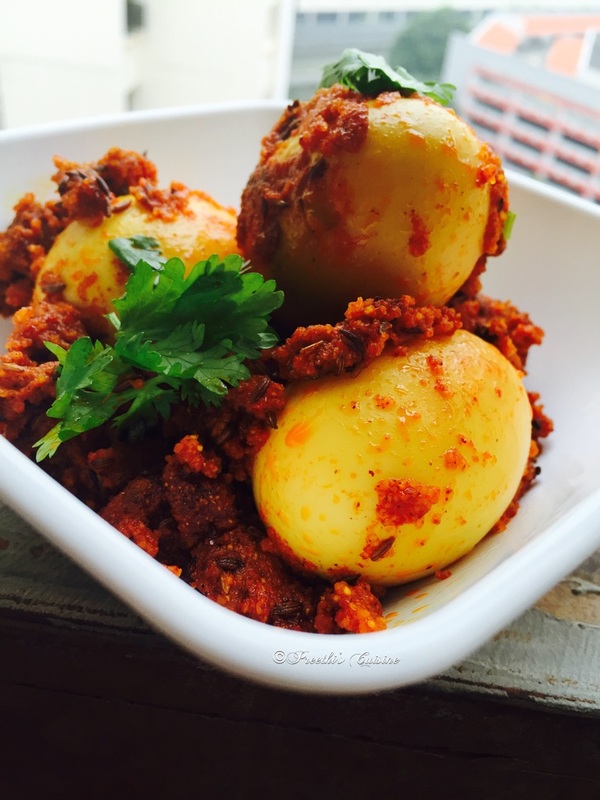 This week I am back with a lip smacking recipe that is loved by my family and guests. This is one of the most appreciated recipes at the potluck parties / get together. Long school holidays have started and we just find reasons to meet our near and dear friends. We always look forward to long weekends so that we can host potluck / parties.Planning a menu for the parties / potluck can be daunting at times. Especially if you have sudden plans to host one. If you fall under this category book mark this recipe . It is an absolute crowd pleaser and will leave your guests craving for more. 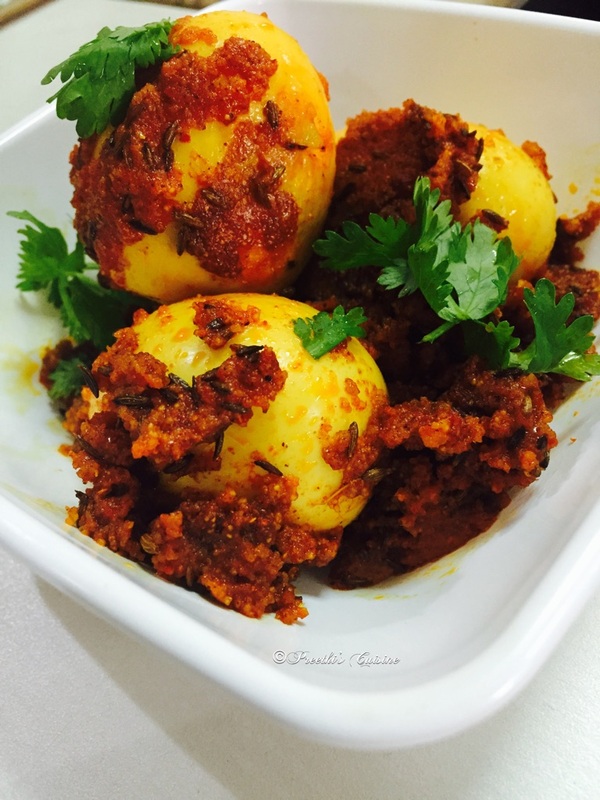 My contribution for 174th #Foodiemonday #Bloghop theme #PotluckRecipes is this yummy Spicy Egg Masala. The theme was suggested by me. I am sure you will find lot of ideas from my bloggers friends who will share their amazing recipes for the theme. 1 Tsp Shev Bhaji Masala (Given to me by my maharastrain friend.This is from Khandeshi Cusine).You can use garam masala instead. Take a wide bottom pan. Add Tbsp oil. Once the oil is hot add 1 tsp jeera, pepper corns and haldi.Then add the chopped garlic pods and onions.Roast on mediumflame untill the onions turn slightly brown .Once done add green chillies ,chopped coriander (keep aside for garnish as well) and chopped tomatoes. Once the tomatoes turn mushy add the bread slices.Mix well and roast on medium flame for about 5 mins. Switch off the flame and allow it to cool. Grind the masala and keep it aside. Heat the pan. Add 1/4 tsp oil.Once hot add chilli powder and slightly shallow fry the eggs. Remove the eggs and keep them aside. In the same pan add balance oil. Add jeera.Now add the ground masala and let it simmer untill oil starts to leave the sides. Add Shev Bhaji Masala / Garam Masala and salt to taste.Let it simmer for 5-7 mins untill the raw masala smell is gone.Switch off the flame. Add the fried eggs to this masala and garnish with fresh coriander. Serve hot with Rotis /Naan or steaming hot rice. Omurice is a popular Japanese food that was originally influenced by Western cuisine. Prepare fried rice and a thin omelette separately, then cover the fried rice in the omelette before serving.I liked this recipe as you can incorporate lot of vegetables into your kid’s diet. It is yummy and they will surely love it. I made Omurice on my younger son’s demand. He had watched a video of this recipe and wanted me to make it for him. I have made this dish to suit the taste of my family. You can make a lot of variations to this recipe. Kids will love it and it is so easy to cook. Serve for lunch or dinner. Heat a heavy Bottom Pan. Add butter and garlic and saute for few seconds. Once the garlic turns crisp, add the green chilli,green bell pepper,yellow bell pepper, red bell pepper, carrot, mushroom, and onion. Stir a few minutes until the onion turns a little translucent. Once done add salt and ground black pepper and mix well. Now add the cooked rice, tomato ketchup, and mix well. Let it cook without stirring for a minute, so that the bottom of the rice gets a little crunchy. Remove from the heat. Transfer the fried rice to a bowl. Fill about half the cup with the fried rice, then if place the cheese cubes and then fill the rest of the bowl with the balance fried rice. Now let us make the omelette. Beat 2 eggs in a bowl with salt,pepper powder and sugar.Heat up a non-stick pan. Add oil and spread the oil .Ensure the pan is properly greased .Turn the heat to medium low, so that the egg is not burnt.Pour the egg mixture into the pan and swirl the pan around to make a nice circle. Keep moving the pan around and let the low heat cook the egg.Once done switch off the flame. Put a large plate over the bowl of stir-fried rice. Flip everything over and remove the bowl in order to have a perfect dome of fried rice.Place the omelette over top of the dome. Garnish with a cheese cube , sprinkle some pepper or garnish with a bit of ketchup or as you like, and serve hot. I served Omurice with pan fried Baby corns. The Mughal cuisine is strongly influenced by Central Asian cuisine, the region where the Turco-Mongol Mughal rulers originally hailed from, and it has in turn strongly influenced the regional cuisines of modern India, Pakistan and Bangladesh.This cuisine has stood with time.The taste of Mughlai cuisine varies from extremely mild to spicy, and are often associated with a distinctive aroma and the taste of ground and whole spices, dry fruits and nuts. Mughals were known for their style and splendour. Mughlai recipes are rich in fat, carbohydrates and proteins.Vegetarians can substitute Paneer /Mushrooms for the meat. There are many exotic recipes to suit the vegetarian palate too. Our 67th #Foodiemonday #Bloghop theme is #Mughlai Cuisine and my contribution is Mughlai Egg curry that is so rich in taste . Remove the shell of the eggs and shallow fry in tsp oil until the sides turn golden brown. Poke them using a fork .Once done keep them aside. In a big bowl mix thick curd,ginger and garlic paste,red chilli powder, garam masala, chopped green chillies , fresh coriander , 1tbsp fried onions and salt to taste.Add the shallow fried eggs (at room temperature) to this mixture and allow it to rest for 30 mins. In the meantime , heat a wok. Add 4 Tsp oil. Add the cumin seeds. Now add the finely chopped onions and roast on medium flame until they turn translucent. Add tomato puree and let it simmer for 5 mins on medium flame. Once done add the curd mixture with eggs , cashew powder, coconut powder and mix well.Add 1/4 glass water (add more water if you want)and salt as per taste. Let it simmer until the oil starts to leave the sides of the wok.Switch off the flame. Garnish with fresh coriander, cashew powder and fried onions and serve with Piping hot rice or Rotis. Eggs are economical source of nutrition. It is easy and less time consuming to cook recipes using eggs. Eggs provide protein, vitamin A, riboflavin, and other vitamins and minerals. The yolk contains all the fat, saturated fat, and cholesterol in an egg. Although eggs contain a significant amount of cholesterol, they need not be excluded from the diet when eaten in moderation. 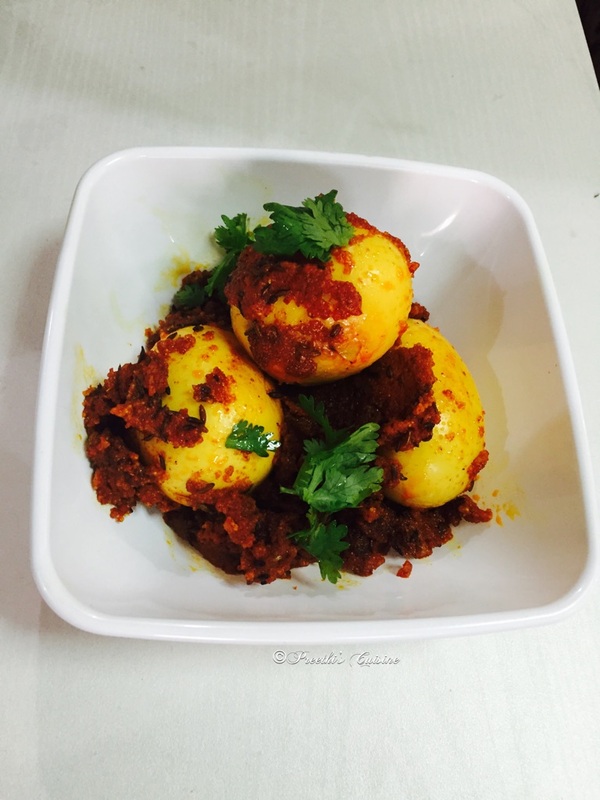 There are many recipes and today I am sharing one of the easiest Egg Burjee recipe. I have boiled the eggs and chopped them into very small pieces. You can also break the eggs and mix with the masala instead of boiled eggs. Heat a thick bottomed pan. Add a teaspoon of oil. Add Jeera and haldi. Saute and add finely chopped onions .Roast on high flame for 5 Mins, but ensure it does not burn. Once done add the chopped tomatoes, finely chopped coriander,aachari masala, sabji masala,red chilli powder and salt.Mix well and close the lid for 2 minutes.After 2 Minutes remove the lid , sprinkle flaxseed powder and chopped boiled egg pieces. Mix all the ingredients and switch off the flame after 3 mins. Pair it with Rotis or Naan and enjoy. Sheer Bliss when eaten hot. Eggs are loved by majority including some vegetarians. They are powerhouse of nutrition. My kids love to have them for lunch sometimes. I have many fab recipes using eggs. They are my saviour when I am running late. Today I will share one more easy recipe that can be made in less time and with all ingredients easily available in your pantry. I am sure you can impress your family and guests with this recipe. Calling all egg lovers !! In a bowl mix rava/semolina and aachari masala. Add water to make a thick paste. Add salt and mix well. Roll the boiled eggs and ensure they are well coated with the masala. Heat oil in a Pan. Add Jeera /Cumin Seeds and Haldi/ Turmeric. Add chopped onions and green chilli and roast till they turn golden brown. Add the Masala coated eggs and roast well for 8 mins. Add the remaining masala and keep it on low flame for 5 mins or until the masala is well cooked. Switch off the flame once done. Garnish with fresh coriander and serve with Steaming hot rice.